Bolton emphasized that the administration’s posture towards Africa would be based upon the interests of the United States above and beyond all else. He suggested that there would be no aid without accountability. 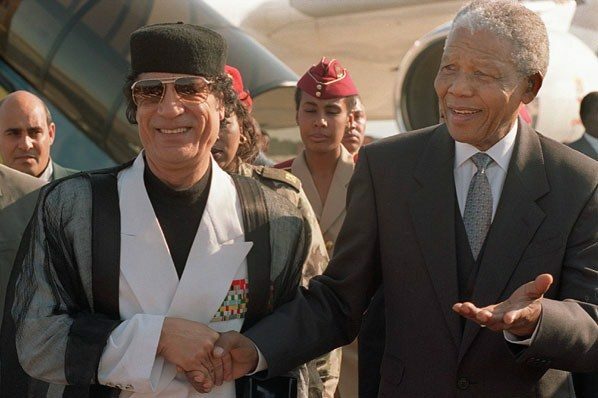 Libya leader Col. Muammar Gaddafi and South African counterpart Nelson Mandela during the early 1990s. It was the Obama administration which led the massive bombing campaign against the North African state of Libya, at the time the most prosperous nation on the continent. Today after the destruction of the country in 2011, Libya, despite its wealth in oil, natural gas and geo-strategic location on the Mediterranean, is mired in poverty becoming a source of instability across North and West Africa as well as being a hub for human trafficking and modern-day enslavement. Although Trump has been condemned for his statements referring to African Union (AU) member-states in the most vulgar and derogatory terms, similar comments and sentiments have been expressed historically albeit utilizing more sophisticated language. Africa has never been viewed by the White House as an equal partner with the U.S. and Western Europe. The rhetorical support given during various periods since the 1950s in regard to Washington’s purported support for self-determination and national independence was done with the aim of protecting the economic interests of transnational corporations. When there was a threat of genuine sovereignty and sustainable unity, these states were targeted for destabilization and regime change. In February 1966, the First Republic of Ghana under President Kwame Nkrumah was overthrown by disgruntled lower-ranking military officers and police forces. 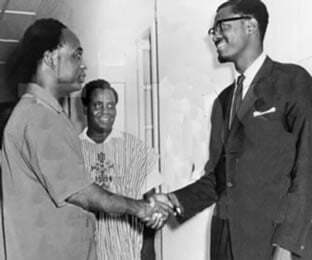 Even though many western-oriented Ghanaians thought they had carried out the coup in response to what was perceived as opposition to the policies of the ruling Convention People’s Party (CPP), it was sensed by progressive elements that the putsch was engineered by Washington. Democratic President Lyndon B. Johnson, who was head-of-state in 1966, has often been portrayed as the most liberal leader of the U.S. Taking over after the assassination of his predecessor, President John F. Kennedy, who was ambushed in a motorcade in broad daylight in downtown Dallas, Texas, the home state of Johnson, on November 22, 1963, LBJ escalated the genocidal war against the Vietnamese people in 1964-65 and invaded the Dominican Republic in 1965 to prevent a leftist government from taking power. Some twelve years later after the death of Johnson and the exposure of U.S. crimes against humanity stemming from the revelations beginning with the break-in at the Federal Bureau of Investigation (FBI) offices in Pennsylvania which exposed the Counter-intelligence Program (COINTELPRO) in 1971, soon to be followed by the documented excesses of the Central Intelligence Agency (CIA) through projects such as Operation Chaos along with the investigations triggered by the Watergate burglary carried out by operatives of the administration of Johnson’s successor, President Richard M. Nixon, a New York Times article by Seymour M. Hersh revealed the actual role of Washington in the removal of Nkrumah. The New York Times, known as the newspaper of record, has never been a supporter of anti-capitalist and anti-imperialist governments on the continent and around the world. Revolutionary movements throughout the continent were systematically opposed by imperialism from the 1960s until the present. In Angola from 1975 until 1989, Washington sought to undermine the ruling Popular Movement for the Liberation of Angola (MPLA) prompting the intervention of Cuban internationalist forces in defense of the independent state. The defeat of the racist-apartheid South African Defense Forces (SADF) in southern Angola in 1988 led to the liberation of Namibia (1990) and South Africa (1994) eliminating white-minority control in the sub-continent. The human rights and peace movements in the U.S. and Western Europe must consistently oppose the militaristic and exploitative policies towards Africa right alongside similar efforts in Latin America and Asia. There must be the building of people-to-people programs which link the problems of poverty and underdevelopment in the U.S., Europe and around the world. 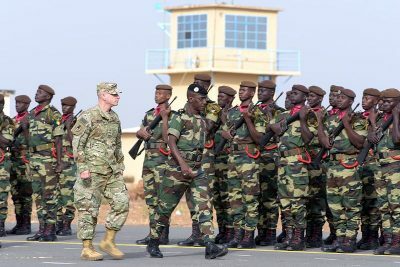 Democrats are not calling for the dismantlement of AFRICOM and its military bases, airstrips and intelligence stations in Africa. There appears to be no legislation from the Democratic-dominated Congress to reform trade policies which perpetuate underdevelopment and dependency between Africa and the western imperialist states. Any political program designed to support AU member-states should take these factors into consideration. Until there is a fundamental transformation of the U.S. political and economic system, foreign policy towards Africa will remain imperialistic. *Abayomi Azikiwe is the editor of Pan-African News Wire. He is a frequent contributor to Global Research.